Epiphone guitars are no longer considered cheap, licensed Gibson copies. These days this brand has a reputation of its own, which is getting closer and closer to that of Gibson with each passing day. It’s fair to say that their acoustic guitars used to be the most popular product Epiphone had to offer. Especially to those on a tight budget. Epiphone DR-100 continues this tradition, and is arguably among the elite of the affordable range. If you ask experienced guitar players about this guitar, they will tell you that DR-100 is Epiphone’s best selling acoustic guitar. That should tell you a thing or two about this Dreadnought. Epiphone went with a combination of select spruce for the top and mahogany for the body. All things considered, this is one of the most popular tonewood combinations in use today. The neck is also made of mahogany and features Epiphone’s SlimTaper profile. Compared to your standard neck, SlimTaper allows for much more speed without compromising grip. The fact that Epiphone implemented that design on such an affordable model is something we have to respect. 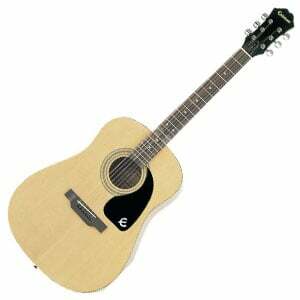 In terms of hardware, Epiphone DR-100 shares that same configuration as most of its competition. A standard rosewood bridge with a compensated synthetic saddle, a synthetic nut and set of die-cast tuners. Epiphone labeled these tuning machines as premium, but they are more or less your run of the mill units. 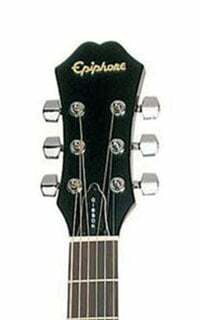 Overall these Epiphones should arrive with sorted out intonation and action. However, a trip to a guitar shop definitely can’t hurt. Once set up correctly, Epiphone DR-100 can deliver quite a decent level of quality in terms of tone as well as overall fidelity. Before we get any further, just be aware that DR-100 punches way above its weight class when it comes to sound. For a classic dreadnought, it lacks a bit in the low-end response, but it compensates any known flaw with an abundance of clarity in the mid and upper range. 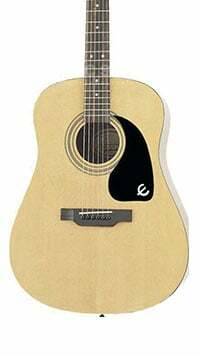 This is one of the few rare affordable acoustics which will react well to all styles of playing, including using a slide. As a beginner guitar, it’s as good as it gets for around $100. With that said, you could easily take this thing out for light stage use. Epiphone gave a lot of homework to its immediate competition when they released the DR-100. This is by no means a new model, but it’s been dominating the affordable range as if it was designed yesterday. Epiphone’s experience, expertise and use of decent tonewood are the main reason why this is the case. Whether you are looking for your first guitar, or just a decent piece of wood to practice on, DR-100 is something we strongly recommend that you check out. For beginners, this is the type of guitar that will keep up with you as you grow your skills. For more info about the Epiphone DR-100, click here. For more affordable acoustic guitars, click here.